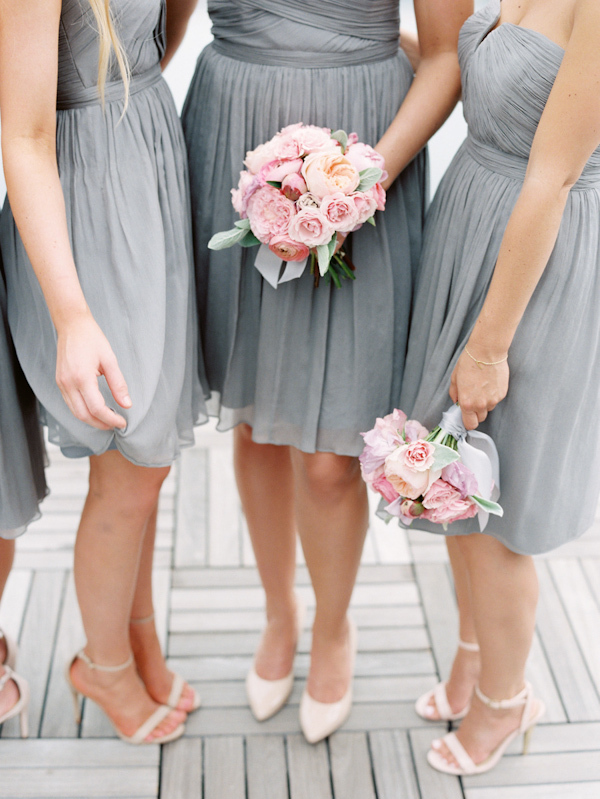 Gray Bridesmaid Dresses. Gray is one of the “it” colors for weddings this year. Not only can anyone pull it off but it can complement just about any type of wedding. If you are looking for a chic color for a bridesmaid’s dress that doesn’t overpower the event, gray is a great choice. Sticking with neutral and natural colors, this bride’s best girls are in long gray dresses in various styles. The length and fabric are the same but the necklines are different and equally attractive on each lady. If dark gray isn’t your thing, consider a pale gray dress like this halter style. A ruffled sweetheart neckline and ruched bodice accompany a long silhouette. This is the perfect tone to match with the coral-colored roses and dusty miller in the bouquets. Settling on one tone of gray may be difficult. One option is to let each lady choose her own shade and style. This pleated jewel-neckline dress is charming and comfortable. With bouquets plush with pink flowers, these slate gray dresses are perfect. Ruched sweetheart bodices with short hems are a fun and flattering look. Dark gray is extremely elegant. For an outdoor wedding, these bridesmaids all wore the same dark hue with dresses made from light material. Each gown has a cohesive element: a fluttery, rippled feature. These bridesmaids have similar looks, with gathered and ruched necklines that are either one shoulder or around the neck; however, they chose different colors for a touch of variety. You can incorporate the color gray with a cream-colored dress embellished with silver and gray beading. These long and forgiving dresses are a chic and youthful choice. Gray is the best of both worlds. It can easily be combined with other colors or can stand out on its own. Your bridesmaids will feel chic and beautiful and best of all, will look marvelous no matter the time of year.